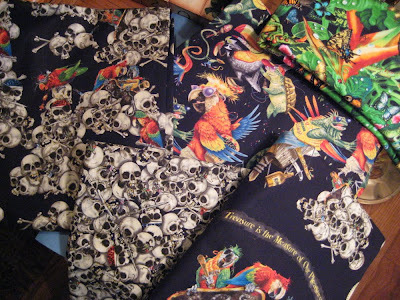 So this is the plan- sew down about 15o little bits of colored fabric in a sort-of color wheel pattern. I took the liberty of adding pink to my wheel. After I cut out all the little bits and arranged them how I wanted them, I ironed Wonder-Under onto the backs of all of them. I did 7 at a time, one of each color so I couldn't mess up my layout. (Sometimes I did 14, making sure that I couldn't get the 2 yellows or the 2 reds mixed up when I put them back in place- I would do ones from the outer ring and the inner ring, for example.) That took about 2 hours to do. Then, after careful scrutiny, I pressed them into place. Now to stitch them all down, that ought to keep me out of trouble for a while! Gosh, I may have to actually take up embroidery again, eeek. Love your wheel. Very cool Sooz. Gee way to show the rest of us up... tehehe!!!! How far is Arkansas from Arizona?! I am coming to the USA!!!! Little old me from little old NZ!! Exciting! Now that bib? It needs to be immortalised forever. Embroidery or a cute little pencil sketch framed I reckon... 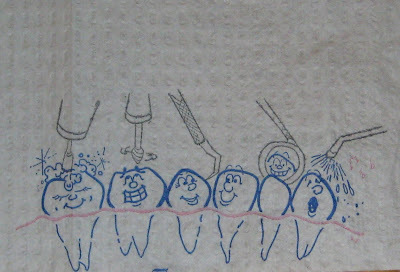 It'd be a cute little embroidery though with a little pouch to put teeth for the tooth fairy! I love the color wheel - what a wonderful idea. I think pink deserves to be in it! 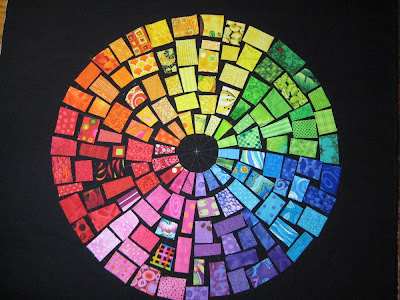 Oh that colour wheel quilt's going to be fab when it's done. I embroidered a colour wheel recently and had to include pink too. It just didn't look right without it! Love that bib!! It's hilarious and I can see it embroideered in simple embroidery stitches then framed. Perfect for the bathroom. I love the color wheel! What a great idea. And your color wheel!! Spectacular!! If you're very, very careful, you could sew those babies down with free-motion instead of turning all of those corners. That's what I'm planning to do with the one that I will (eventually) put together. Good luck!! Love very much the color wheel, thanks for inspiration. Hi, I am a member of a quilt guild in Birmingham, AL. We are in the process of planning a quilt show for next spring. One of the preparations is to have pamphlets printed for the show that informs participants of the classes, show times, etc. 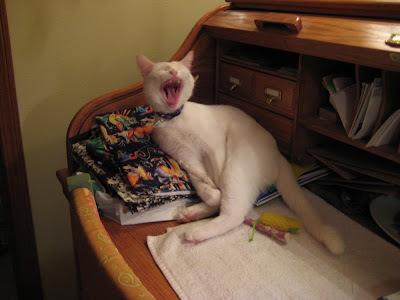 While zinging around on the internet, we found a picture on your blog of a fabric color wheel (under your 2/5/2010 post). Is there a possibility that you would let us use this picture in our brochure? If so, we need a higher resolution image. I know this is out of the blue, but we would really appreciate it. You can email me privately at sdstren@fabricrafty.com.